We were overseas in September and are now home after a detour stay in Asheville, NC. Our trip took us to Turkey, Greece, and Croatia, a panorama of the rise and demise of civilizations and flow of religions: the early Minoan civilization, Roman and Hellenic cultures, the Byzantine and Ottoman Empires, the confluence of Christianity and Muslim, an overview of the cradle of Western civilization. 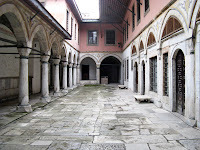 It was mid morning when we walked into the lobby of the Sultanhan Hotel in Istanbul after a 10 hour overnight flight, the beginning of a land/ship tour of the region. Another couple, obviously American and about our age, were checking in as well. We smiled at them; they smiled back. My wife said, “Are you in Istanbul for the Greek Island cruise?” “Oh, sure” I said to myself, what are the odds? “Yes,” they replied and before I knew it we had arranged dinner plans for later that evening. Although we hadn’t slept much during the flight, after unpacking and getting organized, we took a typical tourist double-decker bus tour of this complicated, energetic city, the Topkapi Palace, Hagia Sophia, and Blue Mosque predominately perched in its center, and the Bosporus River isolating the western part of the city in Europe and the Eastern part in Asia. We were looking forward to the following two days when we would return to see those major sites in detail and even take a boat tour on the Bosporus to the point where Europe and Asia almost touch. That night we had dinner with Stuart and Gloria, a little younger than we, but retired as well. Stuart said that he was looking for a word that might describe a vacation by a retired person (who is already on a permanent vacation). I suggested “recation” so if you see that word used, you now know its derivation! After a lovely Turkish dinner on the rooftop of our hotel, with a view of the Blue Mosque glowing in the distance, we returned to our rooms exhausted, hopefully to sleep, getting ready for a demanding day of touring. Following a restless night, we awoke to rain (we were told it never rains in Istanbul!). Naturally we hadn’t packed an umbrella so we were left to “caveat emptor” on the rainy streets of Istanbul. Soon after buying our knock off ‘Burberry’ umbrella and underway again, we noticed a young Turkish man was walking alongside us on the street. “Hold onto your pocketbook” I telegraphed to my wife, but he said, in polite, broken English “Hello, where are you from?” Maybe it was our sleepy fog, but we replied honestly and added that we were trying to find the Hagia Sophia, as the windswept rain made it difficult to get our bearings. 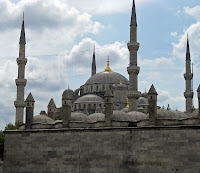 He respectfully suggested that we visit the Blue Mosque first – which we admitted was our second destination – further explaining since it was the period of Ramadan that by noon we would not have access to the Mosque due to the frequent calls to prayer. He said he would take us there, to a “special entrance” but he would “appreciate it” if we would briefly visit his shop nearby after we see the Mosque. So there’s the catch I thought. If it were not for the rain, we would have gone on our way, but we said sure and true to his word, we avoided the main entrance which was mobbed with rain soaked tourists, and instead escorted to a rear stairway –still crowded but at least moving briskly up and into this back entrance, whereupon we were required to remove our shoes. And so we entered the Blue Mosque, which is the national Mosque of Turkey, built in the early 1600’s, combining Islamic architecture as well as Byzantine elements. 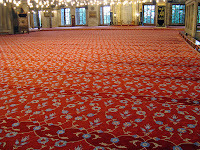 The interior is striking with its ceramic tiles, stained glass windows, chandeliers, crafted marble, and of course the amazing sweep of the carpeting on which hundreds of worshipers turn toward Mecca in Muslim prayer. The crowds were maddening though, so we soon made our way out through the exit, putting our shoes back on, and sure enough our “guide” was waiting for us. We dutifully followed him (a deal is a deal) to his rug store nearby, which turned out to be a pleasant experience and we learned a little about the making of beautiful Turkish rugs, and were served some of Turkey’s famous hot apple tea…. a welcome drink on such a wet day. Although we made it clear that we were not in the market to buy a rug, they were respectful, and hoped we would “recommend” their store and so after a 15-minute detour, we amicably parted. 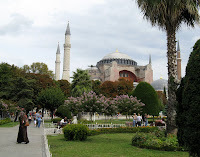 By then, the rain had cleared and we were on our way to the Hagia Sophia which was built as a basilica in the sixth century, survived fires and earthquakes, but after Ottoman Turks conquered Constantinople in the 15th century was rebuilt as a Mosque. It is now a museum and a testimony to the civilizations that built and rebuilt the structure. 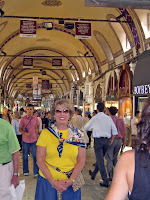 From there we had a typical Turkish luncheon at a sidewalk café and began our walk to the Grand Bazaar where you negotiate your own price in the oldest covered market in the world – built before Columbus discovered America. The shops go on as far as the eye can see. And in spite of the shop owners clearly wanting to part you from your money, we left with the feeling that the people were friendly. In fact, everyone we met in Istanbul was wonderful. So the four of us started off, arm in arm, umbrellas overhead as the rain had returned once again. Most of our search was along ancient cobblestone streets and it was getting to the point, in the rainy darkening night that we were thinking we were entirely lost and perhaps getting into a section of town tourists should avoid. We began to ask people on the street where this restaurant might be but they generally shrugged their shoulders, until one gentleman -- more or less in sign language indicated he was going that way and he will take us. After silently following him through a labyrinth of back and twisting roads we began to wonder, even be concerned. Ten minutes later, with the restaurant not in sight, we were thinking of breaking off from him, but he kept waving his arm as we followed behind. And sure enough he led us to our destination; where we tried to offer him a thank you tip but he resolutely refused our gesture of gratitude. He was simply being a Good Samaritan. It was an atmospheric outdoor restaurant, with an overhead awning. The rain had stopped but later during our dinner the rain became intense and waiters had to hold up the awning with broomsticks to keep everyone dry. It was an experience. No way did we want to venture back to the hotel on foot so they called a cab. With Ramadan services finished for that day, the streets were now crowded with worshipers who could finally break their day long fast to eat and drink. 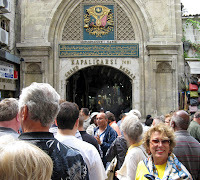 The next day we were scheduled to board our cruise ship at 1.00 pm, although the ship was staying in Istanbul that night, so we devoted the morning to seeing the Topkapi Palace. Our son had been there the previous summer and warned us to get there early, as the crowds by mid morning would be swarming. 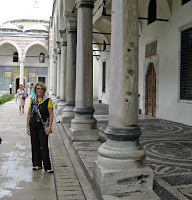 This was the official residence of the Ottoman Sultans for 400 years, that period ending in the mid 19th century. 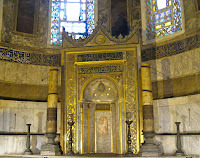 We entered the Imperial Gate and toured the Imperial Treasury and its collection of enormous and breathtaking jewels and then the mosque in the palace where an Imam was chanting from the Koran, it being translated into English on a screen. 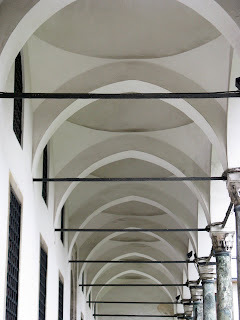 No doubt the most interesting part was the Harem where the sultans’ families were housed, the Courtyard of the Sultan's Consorts and the Concubines, and the privy chambers. 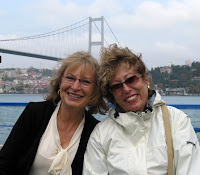 After a light lunch at the Palace overlooking the Bosporus River, we made our way back to the hotel to pick up our bags and taxi off to the ship to meet our friends, Ray and Sue, who were arriving later that day from Connecticut and joining us on this trip. We boarded Oceania’s ‘Nautica,’ a relatively small ship of some 650 passengers and looked forward to our friends’ arrival. By the time they finally boarded late in the evening, we heard one of those “thank-God-it-didn’t-happen-to-us” stories, hours on the tarmac, repairs to the plane, missing their connection in London, having to be rerouted. We finally had a late dinner in the main dining room, an elegantly appointed space in the stern of the ship. Since we would be in port until 3.00 pm the following day, allowing for a final day to see Istanbul, Ray and Sue took the city tour and we boarded a small boat for a cruise on the Bosphorus, where we could view the entire city from the shoreline and work our way up to the point where Asia and Europe nearly connect. The tides were running strong. Small fishing fleets were on the river as well. The water had debris as flooding only a few days before we arrived had inundated Turkey. Stuart and Gloria were on the same tour so we were able to reconnect, take some photos of one another and enjoy the scenery together. 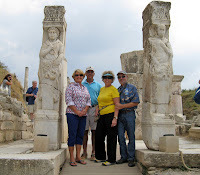 We returned to the ship to prepare for our departure, a cruise that ultimately took us 2,272 nautical miles, to Kusadasi, Rhodes, Delos, Mykonos, Santorini, Katakolon, Corfu, Dubrovnik, Crete, and finally Athens. The trip was all the more remarkable as while we learned about the development, conflicts, and ultimate demise of ancient civilizations, I was reading John Updike’s Self Consciousness, the closest he ever came to writing a formal memoir. So, juxtaposed to the colossal sweep of civilizations over millenniums, I listened to the introspective musings of a solitary man, both concerned about a core element of our lives, the ephemerality of existence, and our need to make sense of moving from nothingness to nothingness as we attempt, as individuals, and as civilizations, to mark our place: we were here. Kusadasi, our first port of call, is the gateway to Ephesus, an archaeological site in Turkey that has the remains of an ancient city that can be traced back to 10th century BC. Here we saw the two-story Library of Celsus, remains of temples, the city’s shops, and its theatre, which is considered to be the largest theatre from the ancient world. 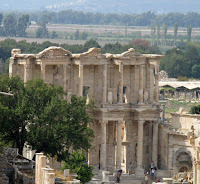 Ephesus was also the home to Paul and one of the birthplaces of early Christianity. The Ephesus terrace houses are perched on a hill. Here the wealthy lived during Roman times. These are under cover and archeologists are putting these homes back together as a giant jigsaw puzzle, but they have constructed walkways so one can tour this site without interfering with this continuing work. Mosaics on the floor and frescos on the walls as well as the remnants of the homes’ heating and sanitation systems are a time capsule from the past. As with many of the archeology sites we saw on this trip, one civilization replaces another, one layer on the other, the inevitable rise and fall, and it makes one wonder about our present “American civilization” – is it in its waning years as a political and economic power? That night we departed for the Greek Islands, to be covered in a later post.